Sgt. 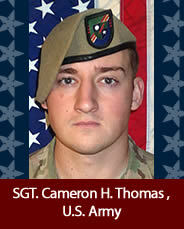 Cameron H. Thomas was killed in action April 27, 2017 in Nangarhar province, Afghanistan. He was 23. Born in Colorado Springs, Cameron was the product of a military family. He grew up across the country and around the world calling Spain, Missouri, Ohio, Virginia and Georgia home. He graduated from Fairmount High School in Kettering, Ohio. Cam was loved. Deeply. By his parents, Andre and Heather Thomas, of Rixeyville, Va. By his 11 brothers and sisters. James, Anna-Leigh, Weslin, Alisha, Devin, Arran, Ena, Chris, Shawn, Alanna and Alexus. By his oversized extended family. By his childhood friends. By his skateboarding buddies. By his Ranger brothers. By his country. Cam was a hero. Larger than life. After participating in numerous special operations, he died surrounded by fellow Rangers, standing tall for his country and fellow soldiers in a night raid on a remote ISIS stronghold that took out the head of ISIS in Afghanistan. To those who knew him, Cam was also a hero in everyday life. By the example he set, by the helping hand he extended to friend and stranger alike, by the perseverance and dedication which with he worked to accomplish the goals he set, whether it was mastering a set of stairs on his skateboard or becoming a Ranger. From mental and physical training, to swimming and sky diving, Cameron’s preparation for becoming a member of the Army’s elite combat team began in the early days of high school, years before his enlistment. Once in the Army, he availed himself of every training opportunity that moved him in the direction of becoming a Ranger earning him the distinction at age19 of being one of the youngest soldiers to ever earn the Ranger designation. Cam was a walking contradiction. He drove a Jetta and rode a vintage Harley. He could strike a menacing paralyzing pose then flash a smile, wink his deep blue eyes, give you a bear hug and be the most loveable person alive. He was equally comfortable draped in half a dozen small kids as he was in the tools of war. He was smart, spoke Farsi, studied emergency medicine and radio technology. Cam, we will always love, miss, and honor you. You will forever be in our minds and hearts.